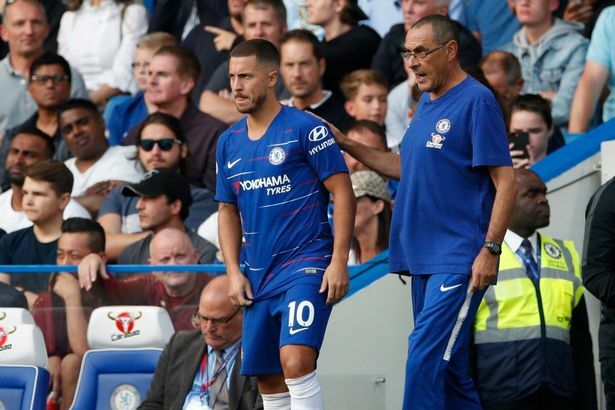 Chelsea manager, Maurizio Sarri, has admitted he is powerless from stopping Eden Hazard’s possible move to Real Madrid. Sarri stated this while speaking to Sky Sports, following their 2-0 win over West Ham on Monday, when Hazard netted both goals. When asked about Hazard joining Madrid, the Italian replied: “I don’t know, I am not the club, I can’t do anything to answer. I can’t answer. [Can we lose him?] From the technical point of view, no not at the moment. There is no other Hazard because the level is so high. I hope Hazard can stay. Real Madrid are hoping to agree a deal with Chelsea to sign Eden Hazard before the end of the season. The Blancos are preparing to make a fresh move for the 28-year-old this week, with the Belgian intent on not signing a new deal with Chelsea. Chelsea value Hazard at £100 million, but Madrid are hoping to pay closer to £85m.